I got to know of this book from Alphonso Dunn's Youtube channel which I've been following for a while now. Alphonso Dunn is an illustrator that also teaches art and science classes in school. His drawing videos are quite popular and I often see them in the related videos sidebar whenever I'm checking out drawing tutorials on Youtube. It's probably not surprisingly that many of the reviews on Amazon come from his Youtube channel. It's great to see that he has compiled a book with drawing tips from many of his online tutorials. It's a helpful reference that complements his tutorials. The information, in book format, is much easier and faster to refer to. 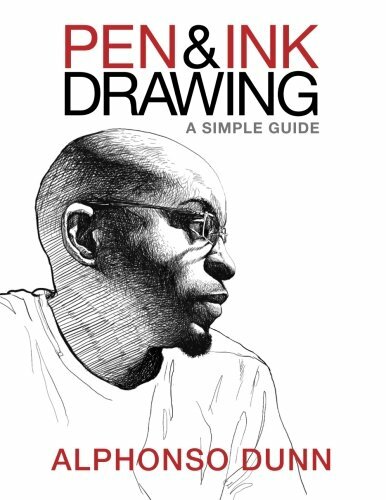 The book's aimed at beginners who draw with pen and ink. This 166-page paperback is a collection of short tips each relating to one main subject such as strokes, texturing, shade, etc. The instructions are concise and easy to follow. There are plenty of illustrated examples and I see that he has purposely left some white space around the book to encourage you to fill with your own drawings and notes. The book focuses on pen and ink techniques. You should know the basics of drawing in order to get the most out of the book. Highly recommended for beginners. And you should check out his Youtube channel for more content.